No Vulgar chords in the Vulgate. Benny 16 has caught up with PP IV June 1565, and has accepted polyphony. Another 400 years and he may accept the demonic interval. God forbid the RC church should become popular. As a schoolboy, I liked nothing more than to hear of the death of a priest, since that meant us choirboys heading to St Mary of the Angels to belt out that old chestnut "Dies Iræ" . It seems that Vatican II dumped this because it. . ."overemphasized judgment, fear, and despair" I trust that Benny. will bring it back. 22. You prefer to make acronyms for phrases such as "OA" for over acting, or "TNT" for,well, you know. Some Americans try Jollibee - and you thought USAnian food was gross? Yesterday Anna Liza Gandia, 35, was at the clothes and gift shop in Balanga, Bataan, where she worked as a cashier. At 4.30 pm two men rode up on a motorcycle and pumped nine bullets into her (two in the face, five in the torso, and one each in the nape and thigh). Gandia (also known as Annaliza Abanador) helped to organize women workers for Pagkakaisa ng Kababaihan (affiliated to leftist group KPD). Two other members of this small group, Cathy Alcantara and Audie Lucero, have been murdered in Bataan in the last five months. According to human rights group Karapatan, there have been at least 585 political killings since President Gloria Macapagal Arroyo took power in 2001. Ten cents of investment, he shows, will buy either 1 kilowatt-hour of nuclear electricity; 1.2-1.7 of windpower; 2.2-6.5 of small-scale cogeneration; or up to 10 of energy efficiency. "Its higher cost than competitors, per unit of net CO2 displaced, means that every dollar invested in nuclear expansion will worsen climate change by buying less solution per dollar." The pebbles are graphite, and an Emotionalist (Terror is an emotion) could tip a bucket of kerosine over them & set them alight. Sure, they have self-limiting criticality, but they do burn. Wormwood featured burning chunks of graphite whizzing through the air. (ever seen a chip of cold, non-radioactive sodium make contact with water? 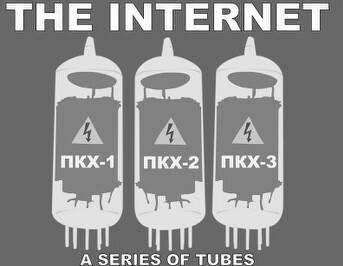 "The Internet, a Series of Tubes"